Judo combatants fight one on one, barefoot. Each martial artist tries to throw his opponent off-balance by pushing and pulling. This technique sets up a final backward or forward throw-over onto the mat. While fighting, martial artists maintain an attitude of ‘mutual prosperity’. This is one of Judo’s principles; the other is the ‘maximum yet efficient use of energy’. Judo footwork involves holistic control: carriage of head above hips, unreadable eyes, calm breath, flexible torso and complex hand movements that synchronize with feet. The martial artist’s footwork begins simply in the ‘natural position’. Whether advancing or retreating, swinging, sweeping, clipping or hooking his feet, the fighter’s posture and way of walking are integral to his movement and state of mind. Integral and intriguing. Enduring the pushing or pulling of judo is possible with solid balance. The fighter keeps his feet shoulder-width apart, pointing outwards at about 45°. His weight naturally projects over his big toes, always equally on both feet. His knees and hips are relaxed and slightly bent. The fighter’s legs, hips and feet all move forward or backward at the same time in the natural position. Weight continues to be evenly distributed on both feet. He would never put one foot forward and ‘leave his other foot behind’. Rather, he would take a step forward on his right foot and bring his left foot forward far enough while remaining in the natural position. The left one more or less follows the right. The Japanese name tsugi-ashi literally means ‘following feet’. ** He walks with his hips. His feet do not move too far apart or too close together, his body—head, shoulders, hips—rise and fall. He walks with a smooth sliding gait. 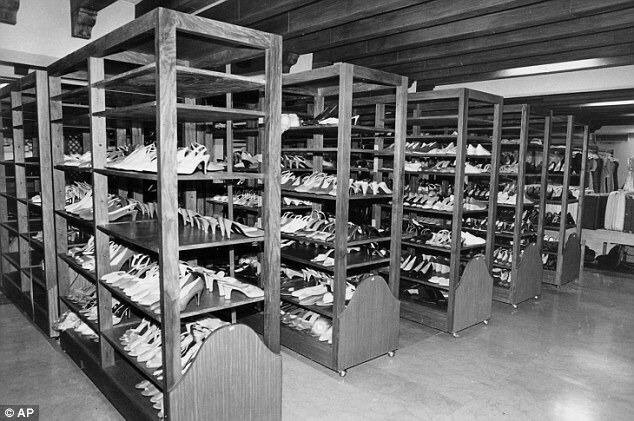 Imelda Marcos became known worldwide for her massive shoe collection. She was often used as a symbol of excess in the Philippines, where many residents were forced to walk barefoot due to the extreme level of poverty in nation. The flamboyant first lady’s infamous footwear collection is housed in the National Museum in Manila. The once beautiful and expensive designer shoes have now been ravaged by termites, storm damage, and just overall neglect. The enormous shoe collection was among the belongings left behind when the former Philippines’ first lady and her dictator spouse were driven from the country by a revolt in 1986. 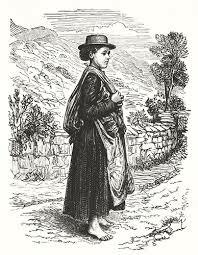 In the year 1800, 15-year-old Mary Jones walked 26 miles in her bare feet to buy a Bible. Owning a Bible in Wales at that time was rare; they were expensive and scarce. Mary saved her pennies for six years. Her journey began in the village of Llanfihangel-y-Pennant taking her over streams, through valleys and around mountains to Bala. Upon arriving at the home of the Bible-seller, Thomas Charles, Mary’s hopes were dashed. His supply of Bibles were all sold or spoken for. Her despair moved Mr. Charles to sell her one, even though he had promised it to someone else. Mary’s journey began with her longing for a Bible. She ‘put feet’ to her resolve by saving and by walking. Being poor and barefoot were not hindrances. Indeed, her effort and her disappointment affected Thomas Charles beyond making sure she went home with a Bible. He wanted there to be Bibles for all Welsh people. This led to the 1804 founding of the British and Foreign Bible Society in London. The barefoot journey of Mary Jones had resounding impact. Nothing. “If you really want to learn good technique, don’t use any shoe, because you get all that feedback from your feet,” Harvard researcher Daniel Lieberman says. Whether you’re barefoot or in a minimal shoe, start by running no more than 1 km a week. From there, increase your distance by 10 per cent each week, says Prof. Ferber. “We really want people to reduce their mileage and build up very slowly,” he says.